An ESL lesson plan about describing people is an essential part of any beginning English curriculum. However, it also offers intriguing opportunities for students of any level. A lesson on describing people can follow many paths depending on the students' understanding level and the needs of the curriculum. Most ESL lesson plans on describing people begin with physical characteristics. Because these concepts are easily observed and described or depicted in illustrations, they can be a great starting point for beginning students. Teachers can use photos in books, ads cut from magazines, or pictures printed online. Laminate loose papers to create an image bank you can use again and again. Online worksheets, like those offered at ESLprintables.com, are a helpful resource. Record snippets of a television program so students can describe the actors. Teachers should take care when using any activity that requires students to describe each other. Depending on the maturity level of the class, this can lead to hurt feelings. This would be an opportune time to discuss larger cultural issues related to appearance and being sensitive to others. For instance, in many parts of the Spanish-speaking world, it wouldn't be unusual to hear an overweight man referred to as El Gordo. However, it would not be acceptable to use a similar nickname like "Fat Guy" for someone in the U.S. While personality traits are usually straightforward, single-word attributes, they can be a bit more complex to identify than physical characteristics. What does it mean to be helpful? What does a shy person look like? Teachers can turn to the same types of images used in depicting physical characteristics to build a lesson plan. Cultural lessons can include a discussion of favorable personality characteristics in different countries. In some places, being confident and outgoing are prized characteristics. In other cultures, it is preferable to blend in and always be humble. For a paired activity, give one student an assortment of images and ask him or her to secretly select one and describe the person. The second student must read or listen to the description and try to guess which image is being described. Another option is to tell students to draw a picture or write a description and then ask other students to figure out what personality trait he has depicted. While learning words like short and blond can help English language learners pick a stranger out of a crowd, understanding the terminology related to emotions can help them get along with others and enjoy healthier relationships. The "How Are You Feeling Today?" poster is a popular classroom resource when discussing emotions. A cartoon face depicts 30 emotions from suspicion to rage, with a descriptive word beneath each one. Draw on your image bank once again to ask students to describe the emotions people are feeling. For written and verbal work, teachers can present scenarios that would evoke a particular emotion. For instance, "Your younger sister colored in your favorite book. You feel ________." Teachers should be open to a range of responses. 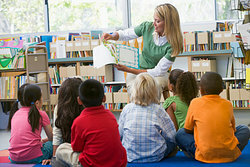 In the previous example, depending on a student's personality, she may say that she feels sad or angry. Teachers can also ask students to discuss and compare cultural standards for displaying emotion in their home countries and elsewhere. The names of common jobs can be a useful addition to any English language learner's vocabulary, whether he or she is an elementary school student dreaming of a future career or an adult needing to employ the services of a professional. In addition to labeling job titles like doctor and plumber, this lesson could introduce new vocabulary related to the professions, such as commonly-used tools or the environment in which they work. Beginning students can write simple sentences describing the actions of the subjects, while advanced students can write complete narratives describing a typical day on the job or why they would like to enter a chosen field. Eslflow.com compiles a list of online resources related to careers and job descriptions, including printable worksheets. Someone from Canada is Canadian, a native of Kenya is Kenyan, but a person from France is French. Help your students become global citizens by discussing descriptive terms related to country of origin. This could be especially useful in a diverse class where the students come from many different countries. A cultural lesson for ESL students in the United States could describe the practice of using hyphenated terms such as Asian-American. "ESL Describing People Lesson Plan." YourDictionary, n.d. Web. 21 April 2019. <https://esl.yourdictionary.com/lesson-plans/ESL-Describing-People-Lesson-Plan.html>. An ESL lesson plan about describing people is an essential part of any beginning English curriculum. However, it also offers intriguing opportunities for students of any level.A lesson on describing people can follow many paths depending on the students' understanding level and the needs of the curriculum.